L.A.’s lost recording work: what can be done? I have been writing about the steady decline of work for L.A.’s studio musicians for 15 years. Back in 2000, I covered the issue at length in the Los Angeles Times. Film-scoring work has continued to plummet, as documented in a recent “white paper” partially funded by the American Federation of Musicians. In this new story for Variety, I look at this very divisive issue and the reasons that, according to one veteran player, musicians are “at each other’s throats” about whether to give up residual payments in order to retrieve the recording work that increasingly goes to London or Eastern Europe. This entry was posted in Film Music, Television Music and tagged AFM, American Federation of Musicians, John Acosta, Local 47, Ray Hair, Recording Musicians Association, Variety on January 6, 2015 by Jon Burlingame. 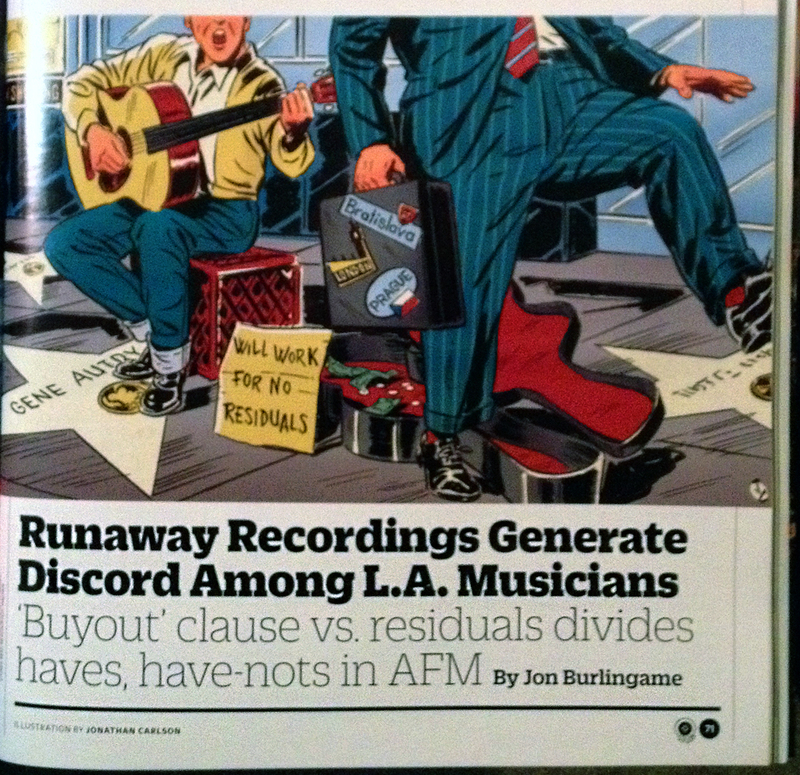 This week, I reported on two issues involving the American Federation of Musicians, which is the union representing all professional musicians (including those who record film, TV and game music, a subject I’ve studied and reported on for more than two decades). The AFM has threatened a leading game composer, Austin Wintory (Journey) with a $50,000 and potential expulsion for recording a game score under non-union auspices. Wintory went public with his situation on Monday. Wintory found that game publishers would not use the existing AFM game-music contract and felt he had no choice. Two days later, the AFM announced a new game contract, hammered out after months of negotiations with Microsoft Corporation. The contract will be available to all game publishers, although some game composers remain skeptical about whether others (in addition to Microsoft) will use it. It’s been a thorny issue for years, among studio musicians and their union reps, as seen in this story from six years ago. This entry was posted in Film Music and tagged AFM, American Federation of Musicians, Austin Wintory, Microsoft, Variety, video game music on June 12, 2014 by Jon Burlingame.